I had never been to Nashville. After learning about Chefs Josh Habiger and Erik Anderson and their restaurant The Catbird Seat, I decided I should pay the Music City a visit. It seemed to me that halfway through a road trip from the Midwest back to NYC would be as good a time to visit as any. So after a graceful night in Chicago Rocky and I hit the road, soldiered through a snowstorm, checked into our hotel, then made our way to dinner(conveniently a three minute walk). Porcini & Parmesan ‘Oreo’. 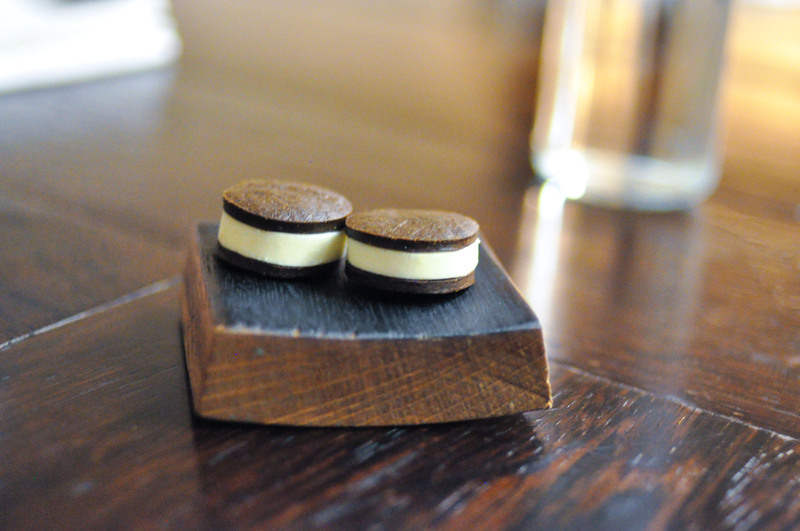 A faux Oreo of earthy porcini mushroom cookies and savory parmesan cream. 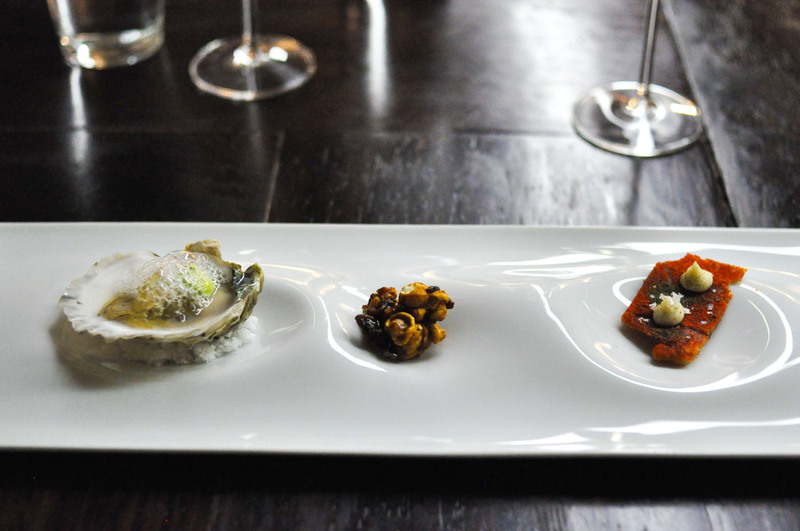 Island Creek Oyster. With kimchi gel and lime foam that did well to highlight the oceanic flavor. Hot Chicken. Fried chicken skin brushed with sorghum topped with cayenne, paprika, and wonder bread puree. A one bite homage to the Nashville classic. Scallop. 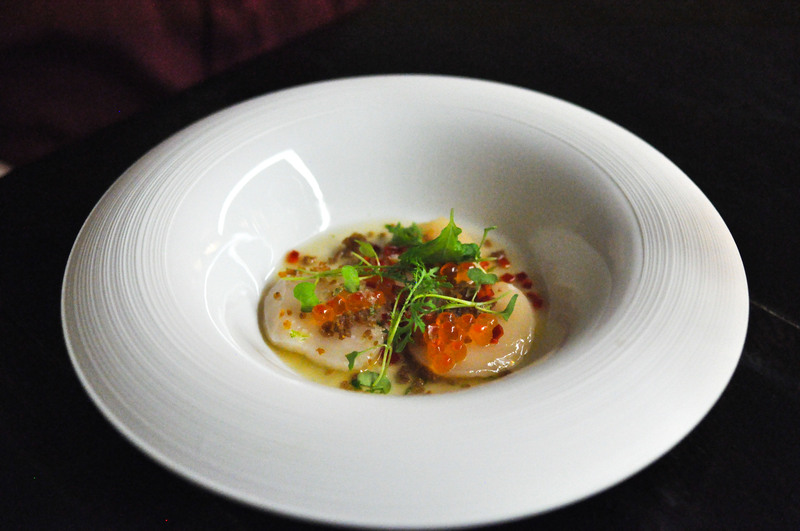 Sliced scallop in oak dashi with Fresno pepper, chicken skin, salmon roe, shiso, and mustard greens. Good layers. The texture of the chicken and the salinity from the roe were great companions to the scallop. 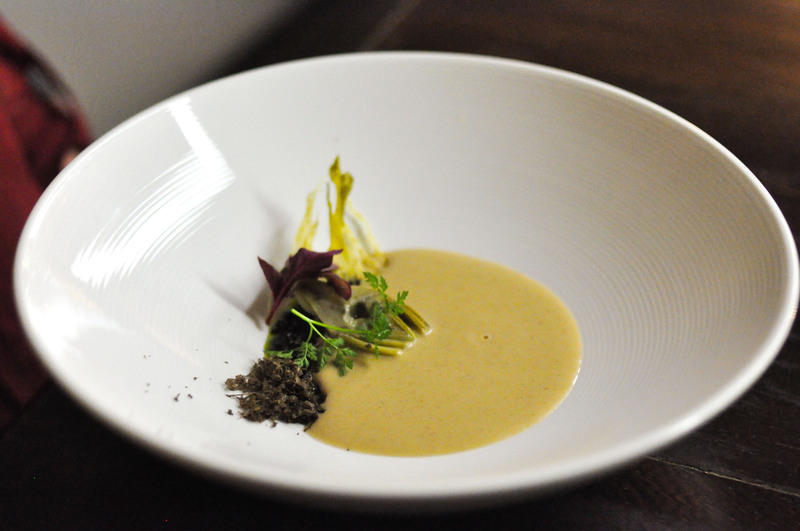 Roasted Sunchoke & Caramelized Yogurt Soup. 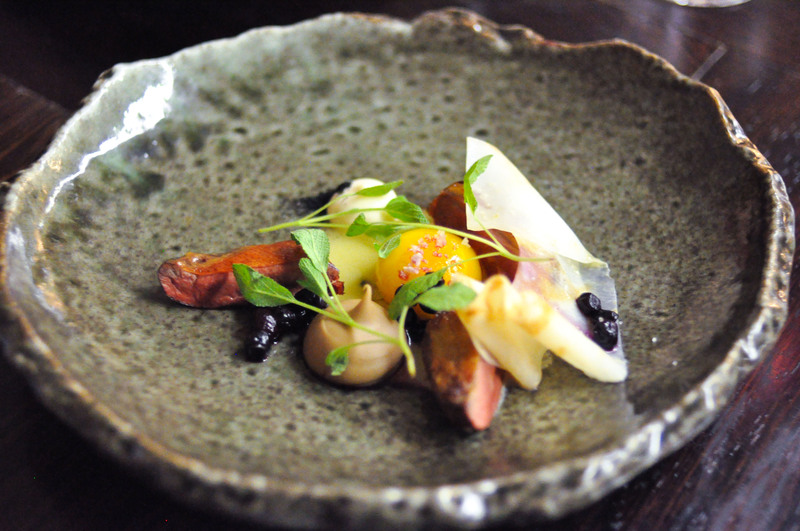 With black garlic, black olive, black truffle, fennel, and artichoke. Many facets of earth flavors laced with good acid and astringency. The pairing of Viura with green Chartreuse was compelling against artichoke/olive taste. 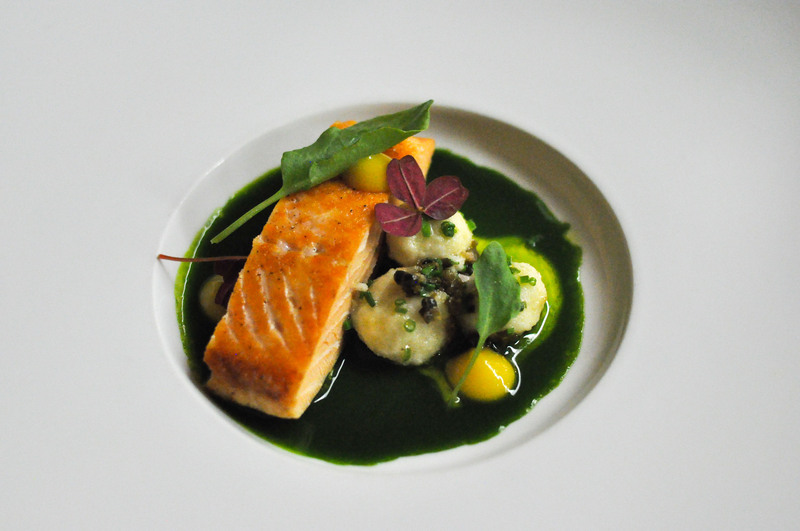 Arctic Char. 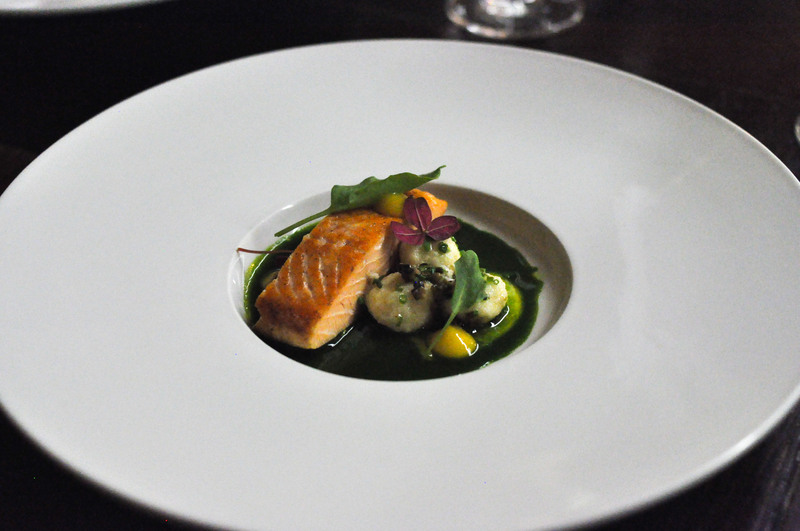 A fantastic piece of fish with amazing ricotta gnudi, meyer lemon puree, sorrel, dill, and ramp capers. Rocky was floored. First she called it ‘ballin’, then simply ‘beautiful’. Palmetto Pigeon. From Palmetto Pigeon Plant in South Carolina. 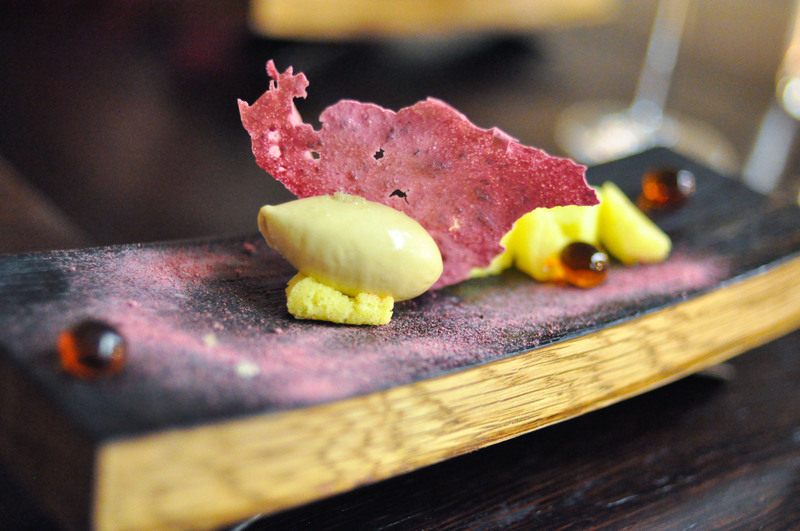 With chestnut puree, celeriac ribbon, sugar cured egg yolk, smoked butter, sage, and huckleberry. This was f*cking delicious. Again with the layers of flavors. Superb richness between the sauces. A little sweetness used and not abused. Beef. Wagyu from Northern California. 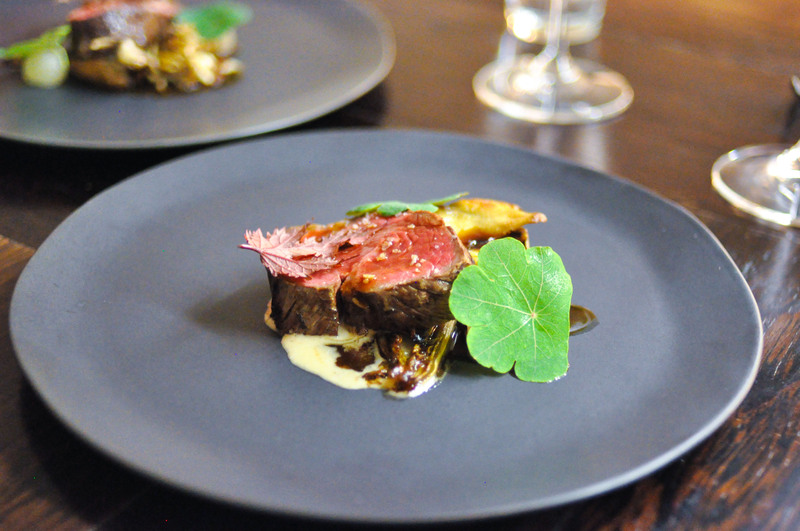 With endive, hen of the woods, asian pear, black walnut cream, black walnut liquor sauce, brown butter chives, hibiscus leaf, and nasturtium. Damn son. These guys can cook. Bold, impactful flavors that maintain coherent balance. Rush Creek Reserve. Coming from Wisconsin, washed rind raw cow milk cheese wrapped in spruce bark. 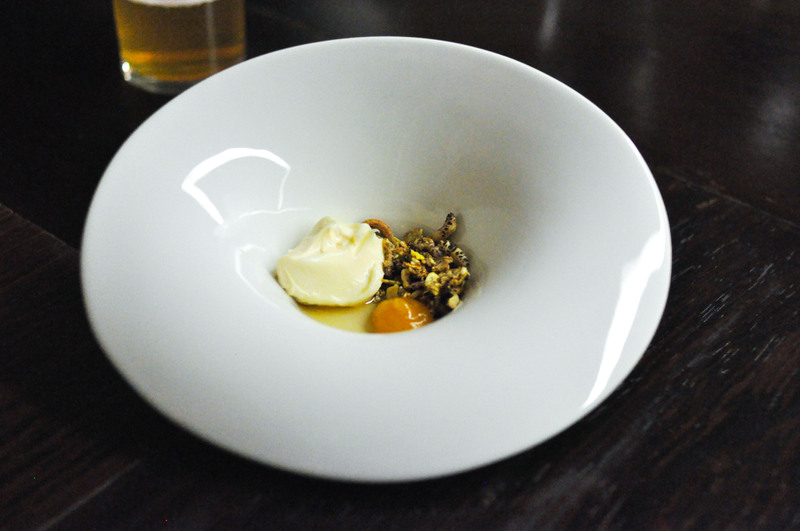 Served with curried granola, apricot puree, and honey. Rocky said ‘This is the coolest cheese course we’ve had’. Certainly an accomplishment in tastes and textures. Coffee & Tea. 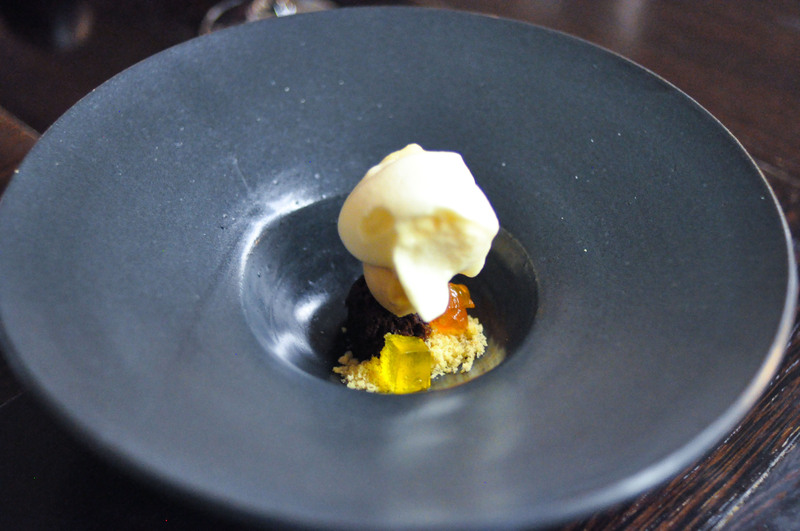 Coffee ice cream with red tea foam, chocolate molasses cake, orange gel, and hazelnut. Egg. 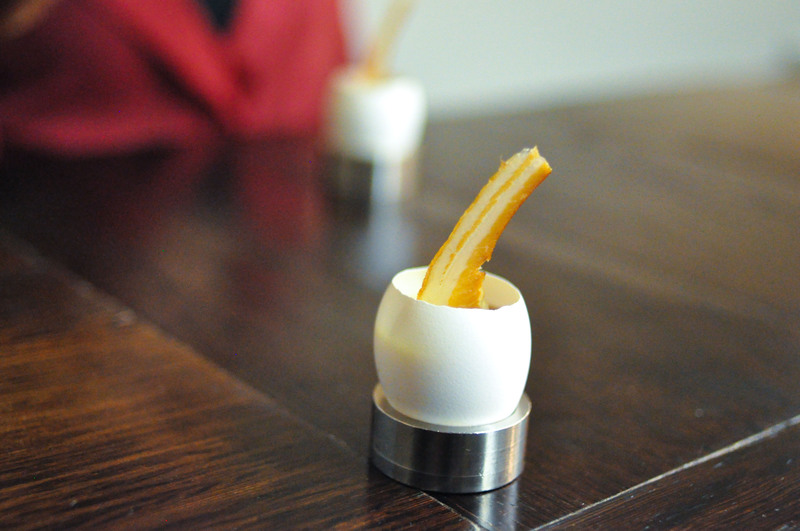 I’ve always liked eating small servings out of egg shells. Maple custard, maple syrup, thyme, and bacon. Rich. Really rich. Breakfast for dessert? Bourbon. 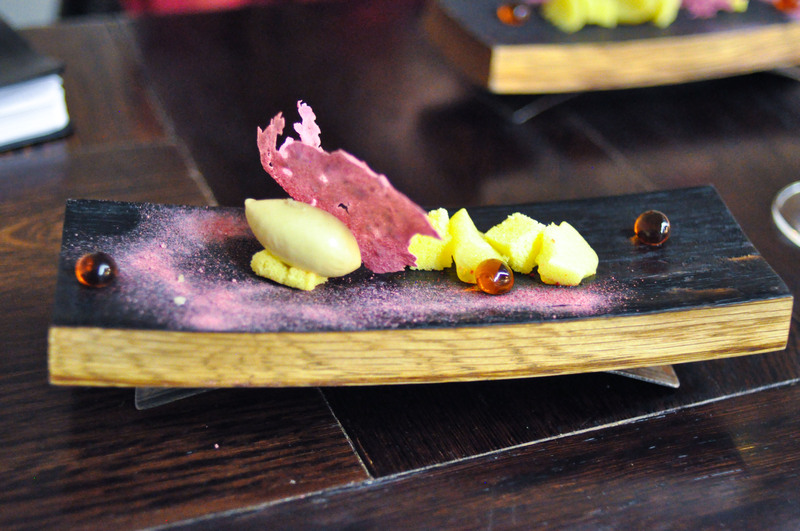 Oak ice cream, vanilla cake, pineapple gel, Bulleit bourbon spheres, cherry crisp, cherry powder. Yet another solid compilation of flavors. I thought the bourbon was going to be too strong, but the boldness really set off the vanilla and fruit. Coffee & Cream ‘Oreo’. 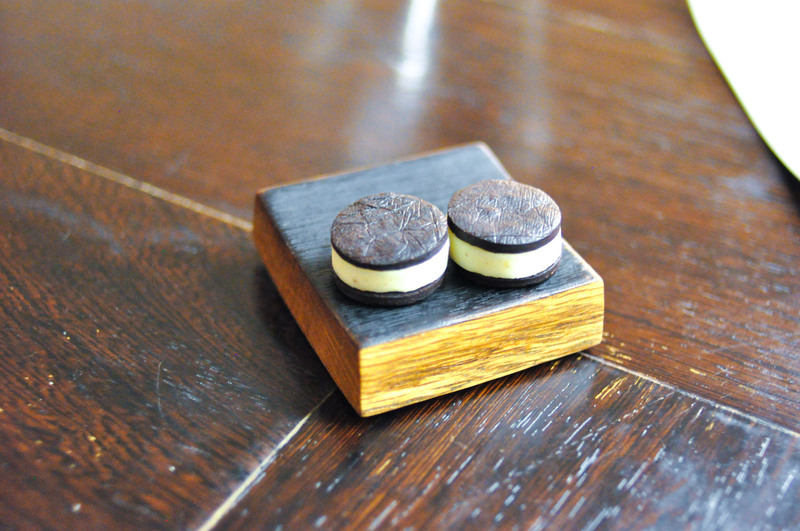 To finish the meal, as we started, another faux Oreo. This time staying true to the original’s sweetness. Chocolatey, creamy, coffee bites. I had come into The Catbird Seat expecting a good meal. Habiger and Anderson over-delivered. I was astounded at how much I loved their food. It’s honest and not over-the-top, yet bold, passionate, and fascinating. I would happily fly to Nashville to dine with them again.